Your journey begins as you wind your way through the city's streets while our local guide points out the highlights and folklore that has made Juneau famous. After a short 20 minute ride out of town, you will experience nature at its best by visiting the famed Mendenhall Glacier. Come face to face with this mammoth river of ice at the Visitor's Center or take a nature walk on the maintained trail. This excursion also includes a countryside journey near Auke Lake before returning back the city. In season, a stop may also be made to witness the spectacular sight of salmon as they head upstream to spawn and die completing the cycle of life. In late August or September there is a chance to see a bear following the salmon. And as always there is the chance to catch sight of an eagle. A must for every cruise visitor! One of the most popular sites in Ketchikan is the Saxman Totem Village. This is Ketchikan’s largest totem park with 29 authentic totems carved by Tlingit and Haida natives. The poles were moved here from the original site in the 1930's and have been restored by native carvers. 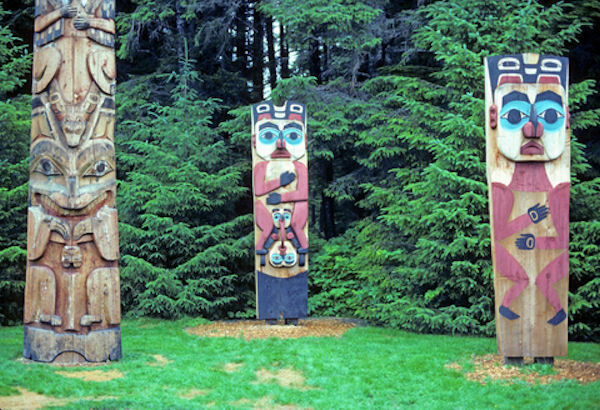 These totem poles are a must see when visiting Ketchikan! The next part of your journey will continue on to Herring Bay, a quaint area that takes you far away from the crowds and people. A small inlet cove that will allow sights and sounds of the beautiful wildlife that only Ketchikan can offer. During Salmon season, Black Bears, Eagles, Herons and Seals are often spotted in this area. Be sure to keep your eyes wandering and your cameras close! Begin your fully narrated journey in historic downtown Skagway as you head to the Gold Rush Cemetery for a visit to our famous outlaw, Soapy Smith and hear tales of early pioneers. The drive up the Klondike Highway parallels much of the Gold Rush Trail of 1898 where stampeeders struggled to climb carrying their ton of goods during winter snows. Along the route are spectacular vistas of steep mountains of coastal rainforest and historical stops, including Brackett Wagon Road, Pitchfork Falls, Bridal Veil Falls, Moore Creek Bridge overlook, and views of the WP&YR railroad. Breathe in the fresh mountain air and watch for wildlife. Upon cresting the White Pass Summit (3292 feet, 1003 meters) , take in views of the sub-arctic alpine tundra of the “Tormented” Valley, with its crystal blue Summit Lake and snowcapped mountains. At the US/Canadian border, have a photo opportunity with the Welcome to Alaska sign! Our return trip takes us to the Skagway Scenic Overlook, which offers a panoramic view of the town, harbor and cruise ships. Included are the Historic downtown and the Gold Rush Cemetery to visit our infamous outlaw, Soapy Smith, and hear tales of the early pioneers. Your guide will bring the Gold Rush to life with many stories of the history of the era. Your return trip takes you to the Skagway overlook, which offers a panoramic view of the town, harbor and cruise ships. Tour varies with order of stops at guide's discretion. Passports (and Visa if necessary) are required. The Butchart Gardens has been designed to please the eye and generally delight the senses. It could be the pale green of emerging leaves in spring, complemented by brilliant pink or white flowers of trees; the dazzling bedding plants framed in by sweeping lawns, with the treat to the nose of a waft of a thousand scents of summer. Approximately 35 minutes from downtown, The Butchart Gardens features over 55 acres of meticulously manicured grounds. Blossoms, fragrances during the summer, and the Night Illuminations, ensure that this will be an experience you will not soon forget. Your bus ride is fully narrated by the driver, so sit back and relax while you hear about the past, present & future of Victoria and surrounding area. This tour gives you the freedom to stay as long as you would like at the gardens. When you are ready to leave and visit Downtown Victoria, you may choose one of several departure times. Don't forget your camera. A passport is required for the Skagway City and White Pass Summit tour. This is a package containing four tours in four ports. Additional tour details can be found in the tour descriptions of each tour listed above.